Personalized Bug Sprayer Custom Printed in Bulk or Blank. Promotional, Inexpensive. Budget Prices in the USA and Canada. Wholesale advertising Bug Sprayer on sale. Lowest cost in North America. Free Artwork Design. American Clients pay no taxes. The unit prices below include you full color custom imprint, or they are for blank (not custom printed) Bug Sprayers. PRODUCTION TIME: 3-5 working days after art approval; Rush production of 1-2 days is available: add 35% for 1-day rush; $0.30% for 2-day rush. Blank (not personalized) Bug Sprayer ship next day. All natural DEET free insect repellent in credit card style container. This product can be used in the toughest environments without risking headache, fatigue, muscle pain and other side effects common to deet based products. Our deet Free Insect Repellent formula is safe to use on children. Insect repellent provides you with the most effective chemical free way to repel mosquitoes, ticks, flies, gnats and no-see-ums. 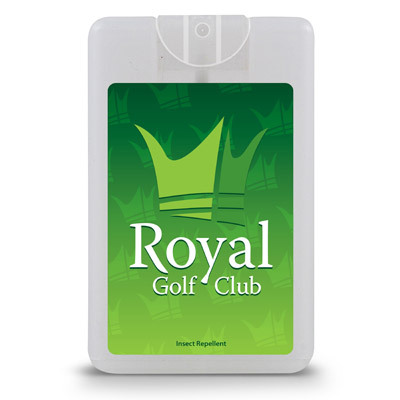 0.66 oz/20 ml in translucent frosted credit card style container which includes a one color direct print or a full color process decal for your retail look.